Brush the corn with a little olive oil and grill over medium heat, turning often until the kernels start to color, 8-10 minutes. Cool slightly and cut kernels off the cob. Heat olive oil in a medium saucepan. Add onions and garlic and sauté on medium heat until translucent, 8-10 minutes. Add chicken stock and grilled corn kernels. Simmer for 5 minutes. Remove from heat and blend with a hand held blender until smooth. Stir in half and half, lime zest and juice, and salt and pepper to taste. Refrigerate for at least one hour. Pour in to bowls and garnish with a dollop of crème fraiche and finely chopped chives. Tip: This soup can also be made with frozen corn in a pinch. You can saute it in a pan to get some color on it. I've just discovered you while I was visiting Weekend Host. What a totally mouth-watering site. I think I'll have to stop awhile and read previous posts. This looks so good. I actually have frozen corn right now too. Thanks for dinner! 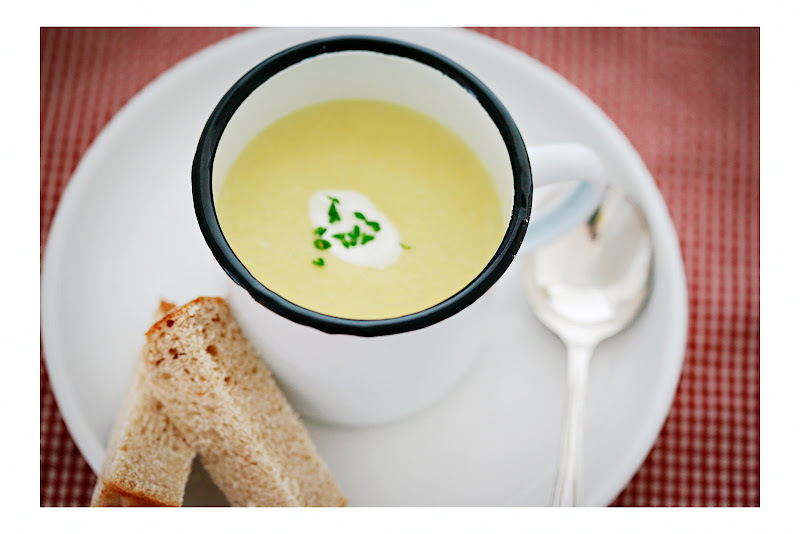 I love corn and this soup looks divine. Your pictures really look great. This would be great on a chilly night! Something to keep you warm and full! Makes me hungry! It's beautiful. Sunday Suppers :: Private Events !